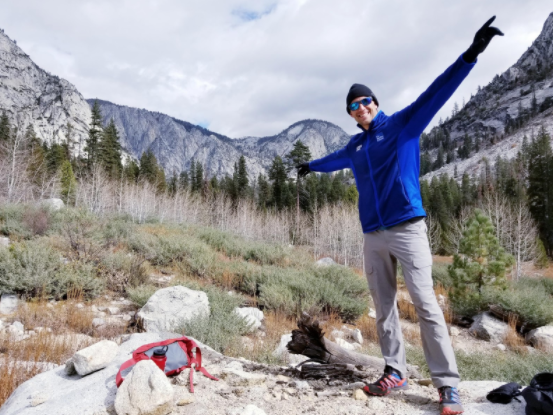 Meteorologist Chris Bruin recently embarked on a journey he’ll never forget… Backpacking up to Paradise Valley in Kings Canyon National Park! It’s no surprise that the outdoors and weather go hand in hand! But when you throw in 14,000 foot mountaintops over the pristine California landscape and an approaching Pacific storm, you are bound to get an adventure full of surprises! That is exactly what happened to my wife and I when we planned our backpacking trip to Sequoia – Kings Canyon National Park. Being a meteorologist, my love for the outdoors extends far beyond the weather… I love the beach, the woods and of course the mountains. Hiking and climbing mountains has been one of my favorite hobbies ever since I moved out to the Northern Rockies a few years ago! If you’ve ever made it to a mountain summit, then you understand how humbling the journey can be. Not only are you in the hands of mother nature, but you are facing some of the harshest elements on Earth. From relentless winds, to steep terrain and exposure, and let us not forget the lack of oxygen and what that can do to your body. But the reward that lies at the top drives you to endure and push yourself more than ever before. Pictures can never do a summit justice, because unless you’ve been to the top of a mountain you’ll never get to experience what many would say is the most surreal experience one can have here on Earth! Anyway, now that you have some context into mountaineers like myself, let us get back to the story. It all begins just before Halloween, when we were putting the final touches on our plans to California and debating whether to summit Mt. Whitney (the tallest mountain in the lower 48) or do our original plan which was to backpack up to Paradise Valley in Kings Canyon National Park! As is with almost all outdoor activities, it was weather dependent. Working here at The Weather Channel, you can bet we had the best meteorologists in the business to help guide our decision! The weather pattern across the Southwest this fall was extremely warm and dry. And because of the cloudless days and lack of snow in the Southern Sierra, the opportunity to climb Mount Whitney so late in the season was still on the table. In fact a few friends of ours had just summited the 14,505 foot beast the week before, which spawned the idea in the first place. But like the old phrase goes, “All good things must come to an end.” And lo and behold, as we neared the date of our trip the days of bright blue skies and warm temperatures was coming to an end as the forecast models kept hinting at a significant Pacific storm moving in just as we were going to begin our backpacking trip across the Sierra’s. Now while rain and mountain snow for California is a true blessing, especially after such a tragic wildfire season, a forecast even with just a slight chance of clouds or snow can cause too many dangers for one to tackle a mountain summit, especially as high as Mount Whitney. So with the forecast verifying that a significant western storm loomed on the horizon, we decided to scratch the plan of trying to summit all together and made the decision to backpack up to Paradise Valley and ride out the storm at a much lower and safer elevation of 7000 feet. Now I know what y’all are thinking right about now. You were hoping to see the journey up to the top of Mount Whitney and the beautiful pics that would go along with it. Well I can assure you if indeed we did make it up to the top and survived, the only pics we would have gotten would be of a whiteout and nothing but a misty, cloudy wonderland where it would be difficult to even see your hand in front of your face. No one wants to see pictures of that, let alone risk your life and go through all that trouble to be faced with a letdown. 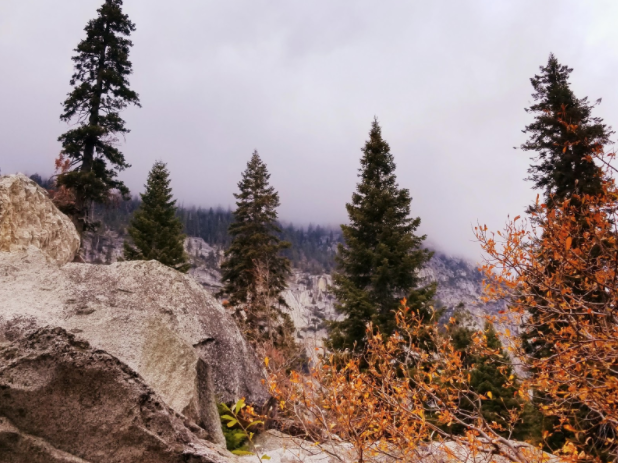 So instead, the change of plans brought new excitement especially to myself of the possibility of riding out a significant fall storm in the middle of a mountain valley filled with flowing streams, huge towering mountains and sequoia trees that soar into the sky. My wife may not to have been as thrilled to find out that we would be camping for three days in the middle of the mountains during a storm that was expected to bring heavy rains and even snow to our destination. I’m not sure many people would. Also keep in mind that it meant enduring multiple days of cold and wet conditions without the comforts of taking a hot shower or putting on ‘really’ dry clothes. But I tend to love to do things that most people wouldn’t. And after sharing my enthusiasm and encouraging her up to the task ahead, we were ready to head out West and begin this adventure of ours and whatever surprises that lied ahead! 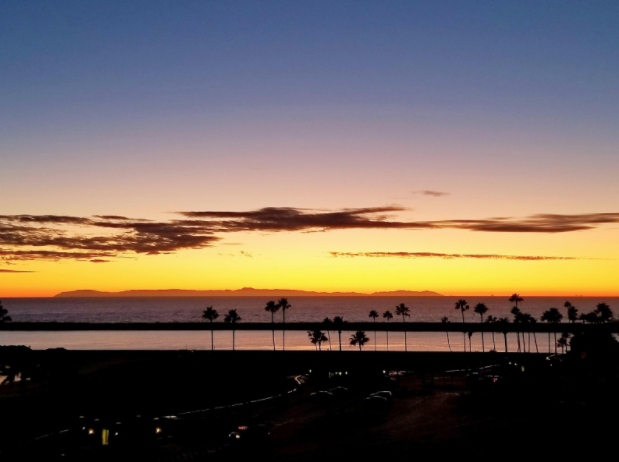 And just like that we packed up our gear, boarded the plane and landed in beautiful Southern California! 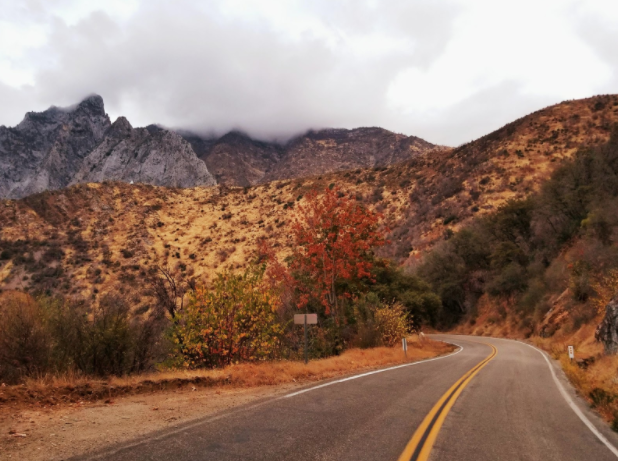 After picking up our rental car we jammed out to tunes and made the gorgeous drive up to Kings Canyon National Park to begin our journey rain, snow or shine! The clouds were rolling in just as forecasted so we wanted to get an early start and try to make it to our campsite before the rain was supposed to begin. 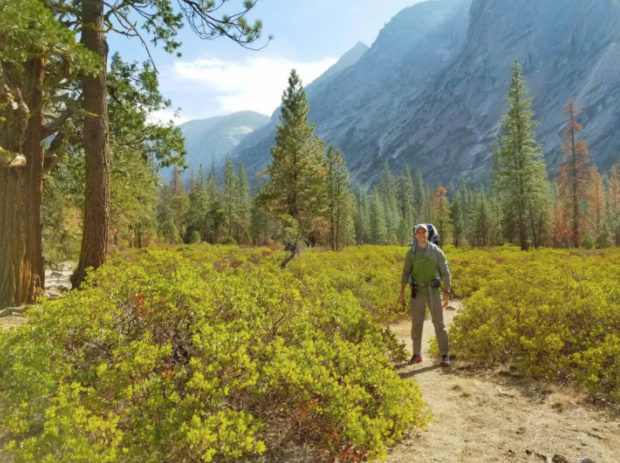 Our day started just after sunrise and to our surprise the skies were clearing up revealing the brightest blue skies against the towering Kings Canyon and the serene meadows that were filled with the most beautiful Sequoia trees. The scenery was out of control with amazement and boosted us with even more excitement and joy to continue exploring this incredible patch of real estate! As we continued down the trail, the views just got better and better and the landscape became all the more dramatic. Even though we were both carrying several pounds of camping gear and supplies on our backs the beauty and awe of this place made the extra weight seem to disappear. With the incoming storm on its way and all the warnings and forecasts put out by the local meteorologists and park rangers, the trails were pretty much abandoned and free from people, aside from a couple of returning backpackers and a few day hikers. Aside from that my wife and I seriously had the place all to ourselves! This is another plus when adventuring in less than ideal weather conditions. But so far so good, and as we continued on down the trail into the afternoon, the weather continued to hold up nicely and allowed for more incredible memories and photo opportunities. As we neared our campsite in Paradise Valley, the skies quickly turned cloudy and the temps began to drop. You could sense that rain was on the way. This was encouraging, because with all the sunshine we had that day, in the backs of our minds we were thinking, with the weather like this, why didn’t we climb Mount Whitney. But like I said before, with the clouds quickly racing in and scouring the tops of the mountains, we were thankful we stuck to the plan and stayed down in the valley! Our tent was placed underneath a thick canopy of towering Sequoia trees with a perfect fire-ring set up in an opening amidst a vast forest filled with sequoias, pines, and oaks. Right on the edge of these deep woodlands flowed the clearest river you could imagine. Since it had been so dry through the fall and summer the water level was relatively low and left a perfect patch of sand along the riverbank for a small beach. Since the beach was outside of the dense woods the views opened up drastically and we were treated with outstanding views that overlooked the surrounding valley and the shear mountain cliffs that soared in all directions. Alright, let’s get back to the story, skies were cloudy, but as night settled in we were thankful the rain still hadn’t started! After warming up and having dinner by the campfire, we took some time to savor the memory being made before our eyes. 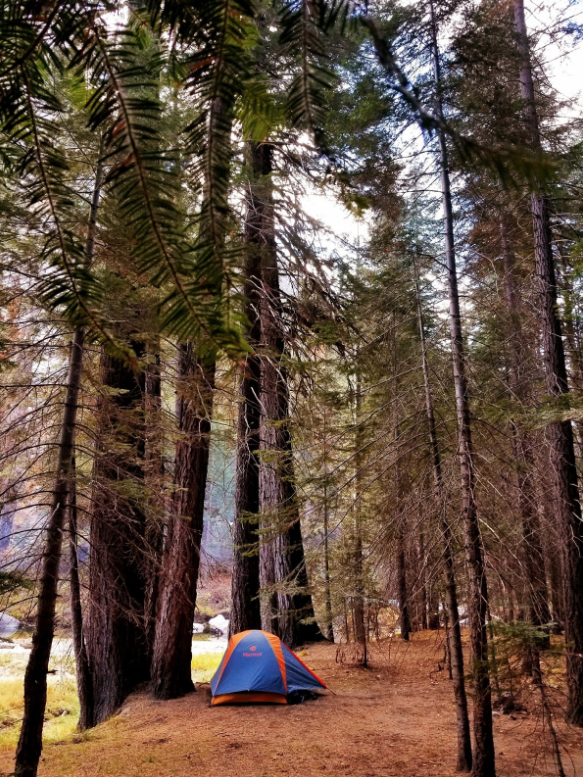 Not a single person, but my lovely wife and I out in the middle of the Sierra Nevada mountains awaiting an incoming storm as the wind blew the absolutely massive trees all around our cozy campsite! It certainly was a sight to behold and a moment I will never forget. As we got settled into our tent for the night, we mentally prepared ourselves for waking up to a drenched scene and what we would do to keep dry for the next 48 hours. It sounded like quite a daunting task but we were grateful to have had such a dry start and with that in mind we quickly went to sleep with hopes of what we would wake up to in the morning. Morning arrived very quickly and I remember being woken up by the morning light trickling into our tent. Anxious to see how wet everything was I hopped out of the tent and observed our surroundings. Believe it or not, the tent, the trees, the ground and everything else was dry as could be. It hadn’t rained a drop while we were sleeping and from the looks of it, it didn’t look like it was going to rain anytime soon! Talk about waking up with a smile upon your face, which is exactly what my wife and I thought when we got our morning campfire started and our coffee brewing! We were stoked to see the weather still holding up and made plans on how we wanted to spend our afternoon. 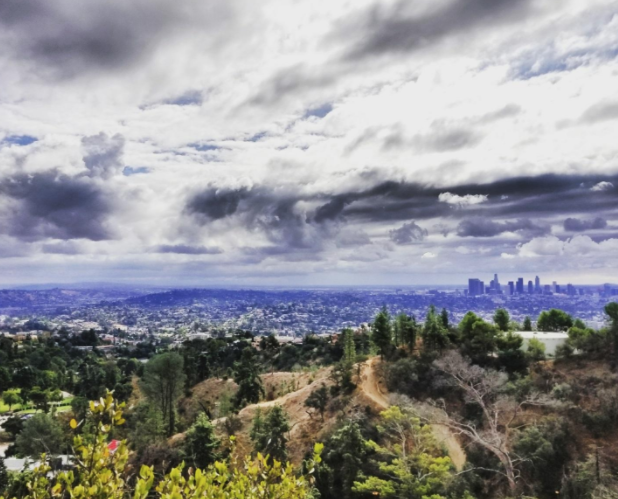 Knowing it was just a matter of time before the skies unleashed we opted for a nice hike further up the valley in search of some epic views! We chowed down some breakfast and got our gear rounded up before heading down the trail into uncharted territory, at least for us! After hiking for a couple of miles we got to this stunning spot surrounded by an aspen grove and 360 views of the jagged peaks that surrounded Paradise Valley in all directions! As you can see in the picture above, skies were cloudy and not a spec of snow in any of the nearby mountains. Temperatures were very mild for early November especially for the altitude we were at, but hey we were certainly not complaining about any of that. Winds would pick up every now and then but the rain and wet weather was still yet to be found. After enjoying a bit of sunshine between the clouds and taking mental snapshots of the views before us, we headed back to our campsite for another night under the trees. The temperatures began to fall, so we made our campfire a bit early and laughed the evening away telling stories and reminiscing of times past. With the threat of rain still on the horizon we decided to get an early start the following morning to hike back out. That way we could stay dry if the rain continued to hold off like it has. With the plan set, we went to bed fairly early so we could pack up and hike out under the moon’s light. After we had gone to sleep, I remember waking up a few times to the sound of raindrops bouncing off the outside of the tent and thinking to myself, the storm has finally arrived! I woke up my wife around 1 in the morning and told her we should probably get a move on and pack up all of our stuff before everything gets soaked. With that said we packed up our campsite and got all of our gear into our backpacks and headed back down the trail from which we came. The rain was on pause for the moment, but hiking along a mountainside in the middle of the night is like a whole different adventure. The glow of the moonlight peeking through the cloudy night sky illuminating the valley below and the faces of the shear peaks is an experience like no other! We cruised back to the car in no time and just in time for the rain to begin. Driving back through the park on our way to the Pacific Ocean, the rain picked up and I looked at my wife thinking we couldn’t have timed that trip out more perfectly. We were prepared for the worst, thinking we were going to get dumped on with heavy rains and even some snow, but in the end it turns out we barely got a sprinkle and managed to stay dry the entire time. Either way we had the time of our lives out in the most beautiful landscape you could imagine. We made it to the coast just in time for sunset and boy was it a treat to the eyes! The weather is always full of surprises and as long as you are prepared, take every opportunity with thanksgiving, because no matter what the elements throw your way, there is always beauty to behold! Glad to see someone of your caliber with TWC! I now have another place on my bucket list. Thanks for sharing your pics and adventure! 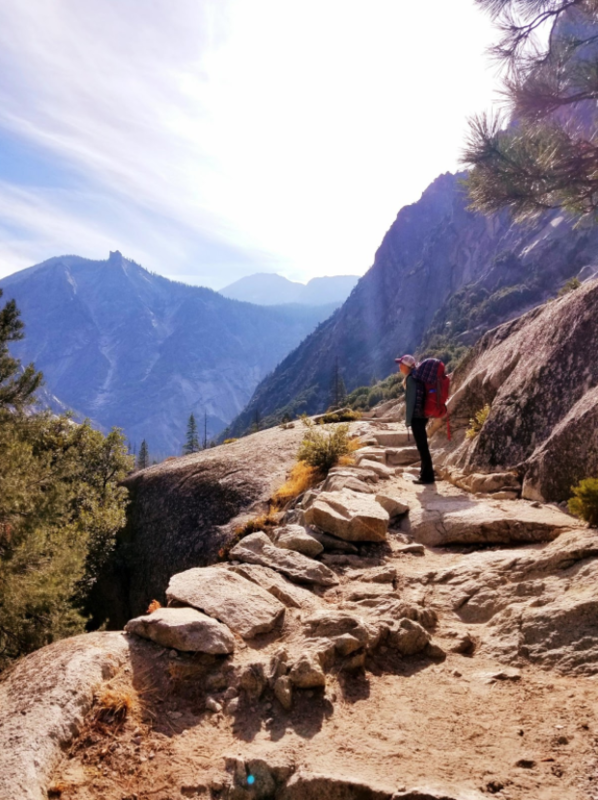 I truly enjoyed your awesome trip to the Kings Canyon National Park story! Your pictures are full of color, and with beautiful backgrounds. Thank you, so much for sharing your trip with us. I like seeing the Sequoia trees in your pictures. Awesome post Chris! I will have to do this with my husband one day. Thanks so much chandlerski5! Certainly add it to your bucket list! Definitely a hike not to be missed!